Have you ever watched a reality show that's focused on the journey of a person trying to improve themselves and after the episode ends wandered where are they now? I know I do. 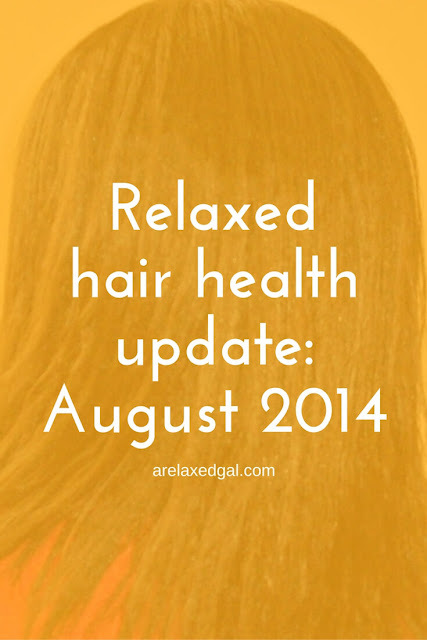 That's why I am starting a monthly post series on the health state of my hair. In several previous posts, I've mentioned some of the issues, setbacks, and triumphs I've had with my hair, but I haven't provided a good update on what happened next. In my very first post, I listed out six goals to help me achieve healthy hair by the end of the year. Let's see how I've done thus far. Result: I am one for two here. 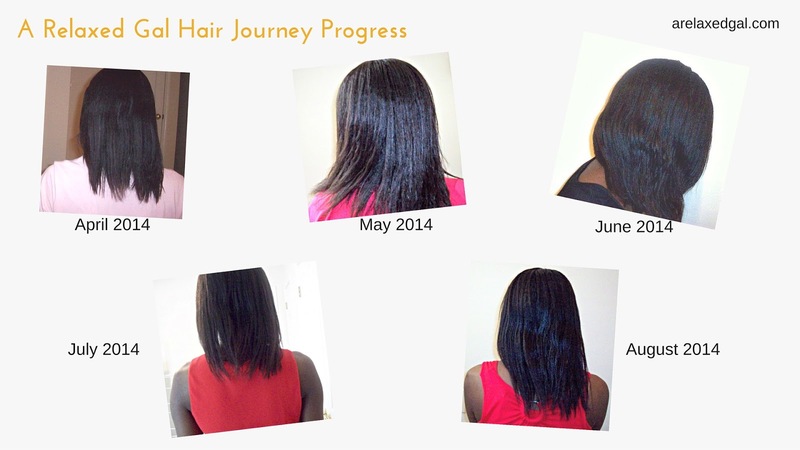 For my relaxer touch up in April I had stretched eight weeks. For my most recent relaxer touch up I stretched 16 weeks. I planned to do this by using my leave-in conditioner every other day, using moisture focused products during cleansing and pre-pooing and deep conditioning each time I cleansed. Result: I totally achieved this. I have been moisturizing and sealing at least every other day. I've done hot oil treatments and steamed during my wash days. I've also been using products that are moisture focused. I found that sticking to a moisture based routine was important during my last relaxer stretch of 16 weeks. Result: I failed at this goal. I haven't really searched for any type of protein treatment that I could use. The only protein I provided my hair was from protein ingredients in the hair care products I used and the food I ate. Result: This is my second full goal achievement! I've found I need to clarify my relaxed hair at least once a month or my hair throws a fit. Result: I've been pretty good about staying consistent with weekly wash days, which seems to be working. So I've only had to do a mid-week wash once or twice. I've been trying to stay away from hair products with petroleum, parabens, and sulfates. I believe using consistent use of products with these ingredients played a roll in the hair issues I had before I started my healthy hair journey. Result: I've pretty much stuck to this goal though I have to admit I'm more of an ingredient scanner versus reader. I've bought a few products and then returned them once I really read through the ingredients. My goal was to drink at least 10 glasses a day versus the maybe four max I'd been drinking. Result: In July I did well. During the month of August though I was back to the four or sometimes fewer glasses of water a day. To do this I purchased some iron supplements and planned to add at least one high iron food item to each meal. Result: I've been eating lots of leafy greens such as spinach and collards, as well as eggs and meats. To incorporate hot oil treatments during my wash days I was going to do them for pre-poos. I hoped they would also help with detangling before cleansing. Result: I did hot oil treatments for pretty much all of July and will be starting them up again during my last wash day. The oils I gravitated towards were sunflower and coconut oil. When I was my hair I section it and braid it. This helps with getting the shampoo closer to my scalp and navigate my new growth. When I put in the braids I had been tying my ends with a hair band, but I found the bands were tugging and pulling out hair. Result: I stopped using hair bands and started using clips. Since then I haven't had issues with hair being pulled out. Result: Done and Done. I've really liked the results so far. I don't know why I didn't start doing the green tea rinses sooner. By doing protective styling and only cleansing my hair every one and half to two weeks I hoped this would cut down on the manipulation. Especially during relaxer stretches. Result: I did only the first half of this by wearing protective styles. I just couldn't bring myself to do the second half. I found I didn't like going longer than a week between wash days. All in all, I think I'm well on my way to having healthier hair by the end of the year. I have noticed that my hair is softer, stronger, shinier, and easier to manage. Most recently my shedding has decreased. Also, I have started to get a handle on my new growth by increasing my use of moisture focused products. How are you doing with your hair goals?